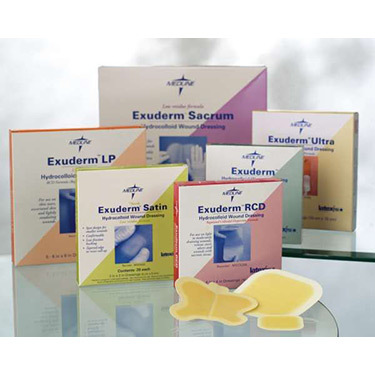 Exuderm by Medline is a range of sterile hydrocolloid wound dressings designed for all stages of wounds in order to create a moist, healing environment. The Exuderm LP (Low Profile) Hydrocolloid conforms to awkward contours on the body to protect superficial and minimally exudating (draining) wounds. Plus, its smooth outer surface helps protect skin from shear and friction. Each dressing is 4x4" and buying them by the box saves you time and hassle.